The Winkler II Utility Knife Model series by Daniel Winkler is the ultimate chore champion. Indoors or outdoors, around the house or on the field of battle you will find that any utility knife from Winkler will help you complete chores or the tactical operation and mission critical assignment quickly and effortlessly. As you grip a Winkler II Utility knife using your favorite grip technique, you will find that it's balanced and secure because of the double guard and shape. The handle is 4.625" long -in Premium Curly Maple. The blade is 4.875" long and has a partially serrated edge on the spine that is well balanced because of the full skeletonized tang. Depending on the knife you chose, the blade is made from 80CRV2 Steel with a Black Caswell Finish. No matter what you chose, the steel blade holds an edge well and is extremely tough. 9.50" in overall length and weighing between 7.4 ounces, this knife is ready for the battlefield or the hardest field work. 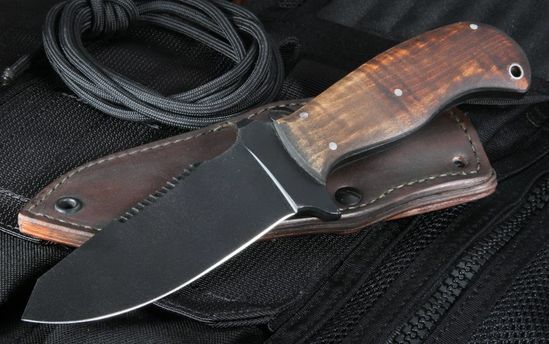 You will be able to use this knife to complete multiple tasks and a wide range of chores such as slicing, cutting rope or tubing and as a defensive weapon just to name a few. These chores are made easy and you won't need to worry about drag when cutting because the Winkler II Utility knife is designed with a diamond cross section tip and wide bevels. 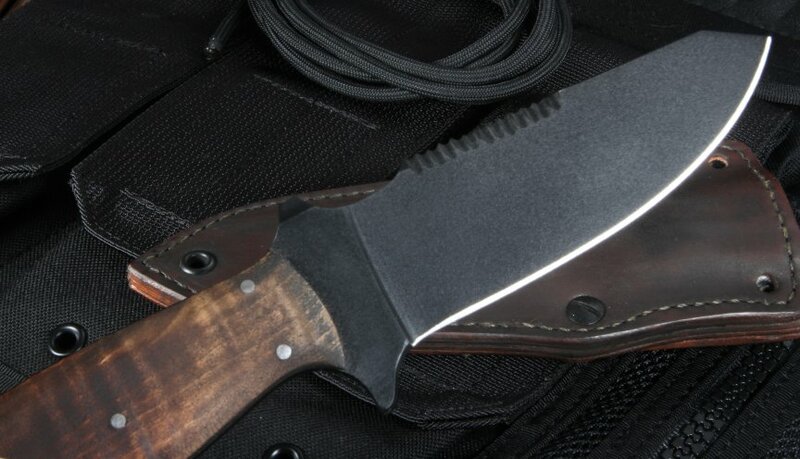 All models of this knife come with a an ambidextrous custom leather sheath lined with Kydex. Whether you're on the battlefield or home from the front, your Winkler II Utility Knife will be ready at your side to work or defend.